Howdy! It's been a few days. I'm sure you've ALL been at the edge of your seat, spending all your time wondering, "How has Major Mom been with the move?" I'm sure you've been up all night worrying about me, right? So we had our stuff delivered on Wednesday, December 1st, and Dave and I spent a marathon FOUR DAYS doing nothing but unpacking. Dave had taken a couple extra days off after our stuff was delivered to help with unpacking. Somewhere in there on Thursday I made it to Hurlburt to do my first commissary run, and on Friday I attended a base spouses' orientation that I probably didn't really need. It was more like "Military Spouse 101"...don't get me wrong, it was a great class, but I was probably not the right audience. I found out Hurlburt Field does this other spouses' orientation that includes a bus tour of the base and that's more what I'm looking for. I'll sign up for that course in January. Anyway, by Sunday the 5th, we had unpacked just about every box and each room in our house was presentable. I could take over with the "refining" while Dave reported back to work. My current challenge: getting our daily routines in place during all this holiday hub-bub! On Saturday we made it over to the beach for a quick photo shoot so I could get some Christmas cards made up. On Sunday night the boys and I made our first batch of Christmas cookies. 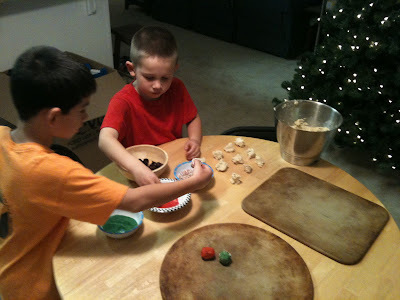 I'll be making dough for some sugar cookies tomorrow. Tonight the boys and I got the bulk of the Christmas cards addressed, stuffed, stamped and put in the outgoing mail for tomorrow. As for school, the boys seem to be doing pretty well. Jacob has a LOT more homework here than he did in Bellevue, but like the school supply issue, I think the amount he's getting here is more par for the course. Jacob has commented more than once that the schoolwork here is more difficult than it was in Nebraska, but I think it's more of a laziness thing for Jacob. He just actually has to do more work. I've had to exchange a couple e-mails with his teacher to seek clarification on some of the classroom procedures. She always replies quickly and has great communication with the parents. I won't argue there! Timmy is absolutely loving his new Kindergarten class. 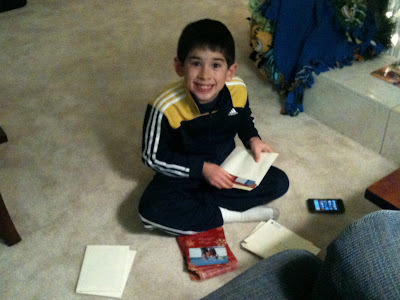 He misses his Nebraska friends, and talks about his friends Roger, Micah and Jackson quite a bit. We had to exchange a couple e-mails with Timmy's former teacher about some school supplies he left behind, and it was nice to catch up with Mrs. Brockhaus! The boys are taking the bus to and from school. I was pleasantly surprised at all the security that seems to go into riding the bus around here. I can only coordinate directly with the county school district transportation office to arrange the pick up/drop off at our new house, and the elementary school kids don't have bus stops. We are instructed to wait at the end of our driveway for pick up, and the boys are dropped off at the end of the driveway in the afternoons. I've met the bus driver "Miss Irene", and the kids just play in the front yard until the bus comes. Our street is arrow-straight and we can see the bus turn onto our street from 1/2 a mile, and 2 stops away. Taking the bus really opens up the length of the school day for the boys, but the boys haven't complained. We're enjoying our new house quite a bit. I'll have to give up a lot of my gardening, since the homeowner has invested heavily in the front-yard landscaping and I won't want to mess with a good thing. The backyard is ab-so-lute-ly BLANK. Grass. That's it. The backyards around us have more trees and bushes, and therefore the wildlife seems to hang out there. We have seen numerous birds in the neighboring yards...on our 2nd day here I had the honor of seeing EIGHT bluebirds sitting on the fenceline. I didn't have my camera with me, so I couldn't get a picture, although it would have been a nice one. And finally, I'll share my newest hobby: a small fountain/pond in my yard. 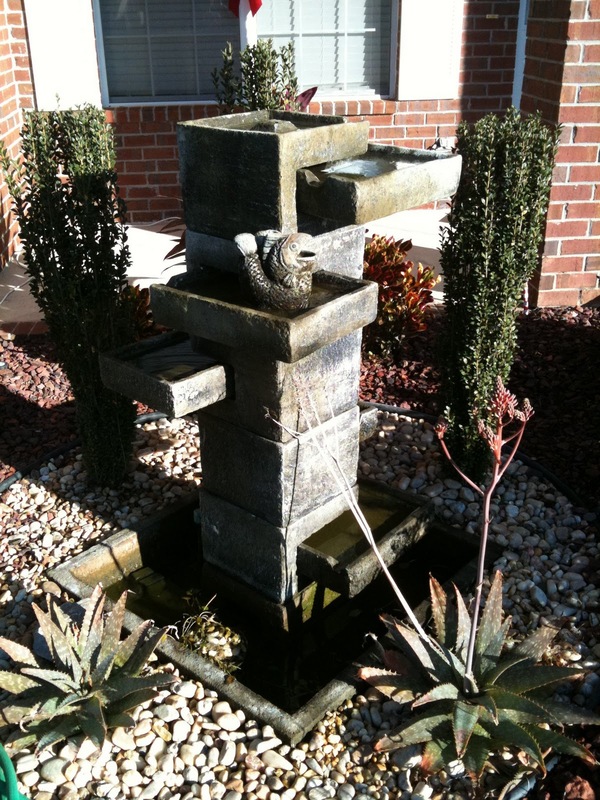 Among the fancy front-yard landscaping is a pond/fountain, a plain fountain and a birdbath! I'm looking forward to seeing more birds in the front yard when the weather gets warmer. The pond was certainly a nice bonus to our house -- and we were pleasantly surprised to see 4 good-sized goldfish swimming around in the pond. The weather's been so cold the fish are more or less dormant so it isn't very interesting. They're also pretty shy, hiding under the fountain column a lot of the time. 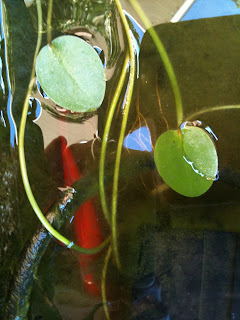 The algae in the pond has been a problem. So these past few days I've been spending 30-45 minutes per day working on cleaning out the pond. As of now, I've done a 2/3 water change, scrubbed the algae off the concrete, and I'm making sure to run the fountain during the day so the water is well aerated. The water I add to the pond is from a well, which means I don't have to worry about chemical treatments or anything like that. Every time I'd agitate the water the algae would stir up and become almost opaque green -- seeing the fish at all has been difficult. Once the temperatures warm up more in a couple months, we'll start feeding them and hopefully we'll see them come out more often. The fountain. The pump sends the water up to the very top of the column and then it trickles down the "trays" that are spiraling around the column. It's very pretty, but I've been challenged with setting the water pressure such that the water doesn't blast out of the trays sloppily. Here's one of the fish on a rare occasion that the algae in the water was settled to the bottom. The boys haven't named the fish yet (I see that coming real soon), but this one likes to hang out near the warmer pump unit when the water's cold. We have two gold ones, and two calicos. Each are 6-8" long.